with a very proud look on his face and say, "Mommy, I found this for you, it was lost in that book over there." Anyway, my favorite series this summer has been the Hunger Games trilogy (well the first two anyway, the third comes out later this month). 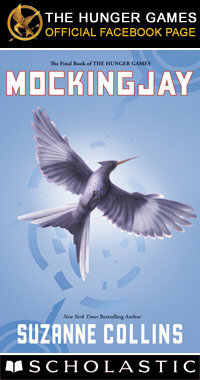 It is a series by Suzanne Collins that is published by Scholastic. I happened to notice that there was a Hunger Games Official page on Facebook, so I Liked it and have been following blogs and discussions. They are even doing a district tour around 13 blogs, all with fabulous prizes up for grabs. Just the other day I got an email that I had won a Mockingjay pin and a copy of Catching Fire. I think my odds are good because this is a series for "youth" and most of the sites require you to be over 18 to enter to win. Yeah me. So, if you haven't read the Hunger Games yet then you need to. If you have read it then I'm curious, who is your favorite character? I have to say, I'm a proud member of team Peeta! !